When it comes to odour elimination, there is no product as effective and environmentally friendly like Zerodour! This biodegradable product is 100% natural and lasts for up to six (6) months. Zerodour is made from zeolite minerals and is one of the strongest natural adsorbers available. When it comes to odour elimination, there is no product as effective and environmentally friendly like Zerodour! This biodegradable product is 100% natural and lasts for up to six (6) months. Zerodour is made from zeolite minerals and is one of the strongest natural adsorbers available. Other products absorb odours but Zerodour adsorbs! With adsorption, the power and integrity of the minerals are never compromised. Now, You can understand why zeolite is used in so many industries. If you wear trainers to play sports, Zerodour will be your shoes' best friend. No matter if you prefer heels or sandals all footwear will be happy. Boots, shoes or sandals, high heels or flat, large or small, will be fresh with Zerodour. 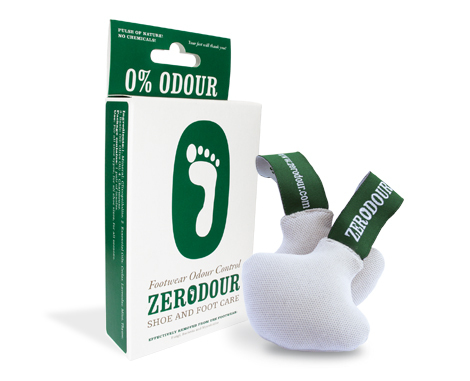 Zerodour effectively removes moisture and neutralises offensive odour that comes from shoes. Mycotoxins (the product of bacteria) and fungi in the shoe are drawn to the Zerodour pouches by the powerful Zeolite compound. These pouches effectively adsorb and trap odour vapour given off by perspiration, while drawing the sweat and odour-causing bacteria into porous Zeolite core, locking it inside. The Zerodour package consists of a pair of pouches for your shoes. Immediately after taking off the shoes, push the Zerodour pouches deep into the shoe. This will allow the insert to fill the tightest spots, allowing the product to work more effectively. Leave the Zerodour to remain for as long as possible. For best results leave the insert to work over night. The Zerodour insert will effectively keep your footwear dry, odour and moisture free between uses, making them as simple to use as they are effective. Regular use of Zerodour will help keep your footwear completely odour and moisture free. After six months of use, Zerodour Shoe Pouches do not need to be thrown out , you could reuse them as substrate for your flowers or grass in the garden. Just cut the pouches with scissors and spread the content over your garden.